Vision Quest Safari is a surprising thing to find just outside Salinas, California. It's about as close as many people may come to taking an African safari, and you don't have to leave the state to do it. Vision Quest Ranch is the sister company of Wild Things Animal Rentals, a California company that trains wild animals for film, television and educational work. Its owner Charlie Sammut wanted to find a way for his menagerie to work without traveling, so he combined his wild animal training experience with a hotel business background to create a bed and breakfast providing close encounters of the wildlife kind. The result is an experience you're unlikely to find anywhere else. 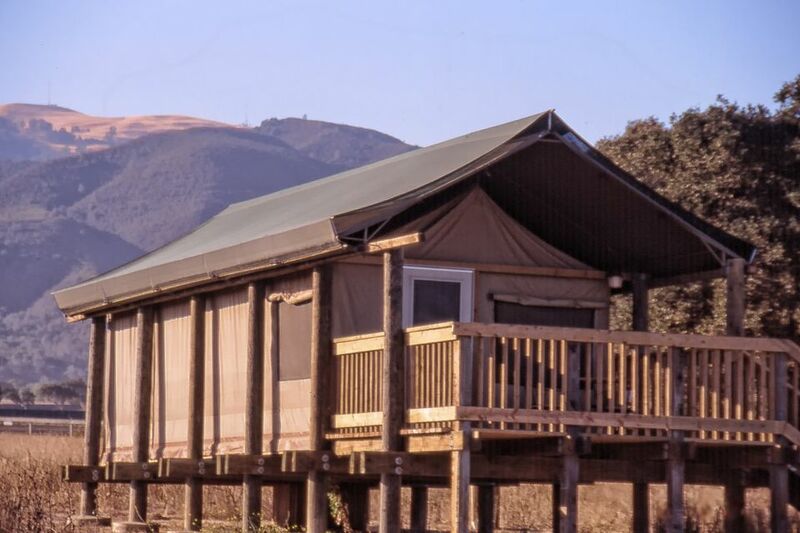 Vision Quest has eight safari-style tent bungalows. They can sleep a maximum of four people each. Some of them face the elephant playground, and the rest have access to viewing platforms. The bungalows are on a raised wooden platform, and they have canvas walls like a tent, but they're decked out with most of the comforts you'd find in a luxurious hotel suite. Each room has its own bathroom. Beds are comfortable and for cooler nights, they're equipped with electric warmers. The rooms do not have telephones and there is no internet service, but you can get a signal from most cell phone carriers. The entire place is 100% non-smoking, inside and out and you will be asked to drive outside their gate if you need to smoke. There is no on-premises restaurant. Instead, one of the animals will deliver your continental breakfast to your tent. There's no pool or tennis court, either, but since the primary focus at Vision Quest is the animals, and you'll find yourself spending most of your time watching them or interacting with them. If you object to animals being in captivity, Vision Quest is not the place for you. Service dogs aren't allowed in the bungalow area because it isn't safe for them or the ranch's animals. They will provide complimentary boarding for them at their dog boarding facility. Each room has a tastefully-done animal-themed decor. If you're particularly fond of giraffes, zebras, big cats or elephants, ask for your room by name. Families are allowed as long as the children are 4 years of age or older. However, this isn't a place where the kids can run around and make lots of noise, and it may be better suited to some little ones than others. If you're unsure, call them and discuss it. Plan to get to your tent before 4 p.m. That's when the trainers bring the animals by. A tour is a complimentary with your stay, but they also offer several other tours, which can be combined with your lodging. For a double dose of fun, book a room here during the Salinas Air Show and you can watch the airplanes practice and perform without leaving your porch. If the weather is very cold, bring thermal underwear or a couple of warm layers and you may be more comfortable.